The biggest of cats, the tiger shows different traits depending on the sub-species. 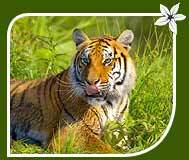 Generally a male tiger measure between 200 and 300 kg, whereas the females weigh between 120 and 180 kg. The average length of a male tiger ranges between 2.6 and 3.3 m. Females, however, are smaller, measuring between 2.3 and 2.75 m in length. Mostly, tigers bear an orange coat, a fair ventral area and stripes that can be brown of hay. The number and density of stripes on a tigers body varies as per their sub-species. Tigers prefer a habitat where they can easily camouflage themselves. They mostly like to inhabit thick grass, dense jungles and undergrowth. And when these predators lie in wait of their prey, the stripes on the skin serve as a perfect disguise. 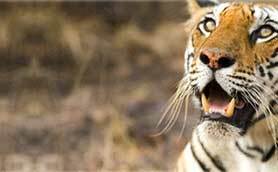 In the forests of Ranthambore and Sariska in Rajasthan, the tiger can also be seen in the wrecking of monuments and temples. During summers, they can be spotted in pools as well. They are good swimmers too. Belonging to order Carnivora, they hunt for preys like deer, elephant, wild buffalo, wild pig etc. 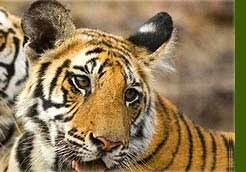 Over the last few decades, the population of tiger has been dwindling very badly. But, thanks to the Project Tiger Scheme thats proved to be no less than a boon for these creatures. 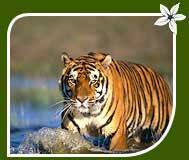 India has to boast numerous Tiger Reserves where the Royal Bengal Tiger can be seen prowling fearlessly.